Delta Lloyd Group is a Dutch insurer with operations in the Netherlands, Belgium and Germany. It consists of Delta Lloyd, OHRA and ABN AMRO Verzekeringen together and a few minor banks. The company is the sixth-largest insurer in the Netherlands, with a market share of approximately 8%. The company is owned by the Dutch foundation Nuts OHRA (5%) and publicly traded (95%). It was previously owned by Aviva. The earliest predecessor of Delta Lloyd, the Hollandsche Societeit van Levensverzekeringen, was founded in 1807. 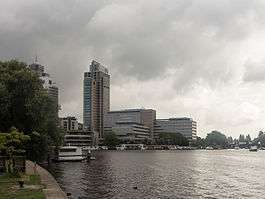 In 1967 it merged with the Amsterdamsche Maatschappij van Levensverzekeringen and was renamed Delta. And in 1969 Delta merged with NedLloyd (not to be confused with the shipping company of the same name). In 1973 all shares in Delta were bought by the British firm Commercial Union (now Aviva). In 1999 Delta Lloyd merged with OHRA. The company was renamed Delta Lloyd Group in 2002. The Delta Lloyd Group officially went public on the NYSE Euronext Amsterdam on 3 November 2009. Delta Lloyd made 38–42% of its shares public, with its major shareholder Aviva reducing its ownership from 92% to 50–54%. Delta Lloyd's other previous shareholder, Nuts OHRA, retained its 8% stake. In July 2012 and January 2013, Aviva sold its part, making the group 95% publicly traded. Delta Lloyd forms the core of the Delta Lloyd Group. It offers saving accounts, insurance and financial planning. OHRA was formed in 1925 and was known as Onderlinge ziektekostenverzekeringsfonds van Hoogere RijksAmbtenaren (Mutual health insurance for senior civil servants). ABN AMRO Verzekeringen is a joint venture between ABN AMRO and Delta Lloyd, giving Delta Lloyd the exclusive right to sell insurance through ABN AMRO offices. It had a revenue of €900 million in 2006. For Delta Lloyd this joint venture represents a vital means of selling insurances. Delta Lloyd was only a small player in the health insurance market with 700,000 customers. Originally, Delta Lloyd tried to merge its health insurance division with Agis and Menzis, but the deal fell through, thus necessitating Delta Lloyd to sell its health insurance division to CZ groep, effective January 1, 2008. Delta Lloyd also offers limited banking products, such as savings accounts and mortgages. Delta Lloyd is also active in Belgium and Germany. In Belgium the company offers life insurance and collective insurance. In Germany Delta Lloyd stopped signing new contracts in 2010. 1 2 3 4 "Annual Report 2010" (PDF). Delta Lloyd Group. Retrieved 22 April 2011. ↑ "The World's Biggest Public Companies". forbes.com. ↑ Kreijger, Gilbert; Ku, Daisy (3 November 2009). "Delta Lloyd falls after IPO prices at low end". Reuters. Retrieved 3 May 2010.